1) Once you've downloaded Nimbus Note and clicked our button, you will see a window with an offer to log in to Nimbus or create a new account. 2) Don’t worry, it takes less than a minute! 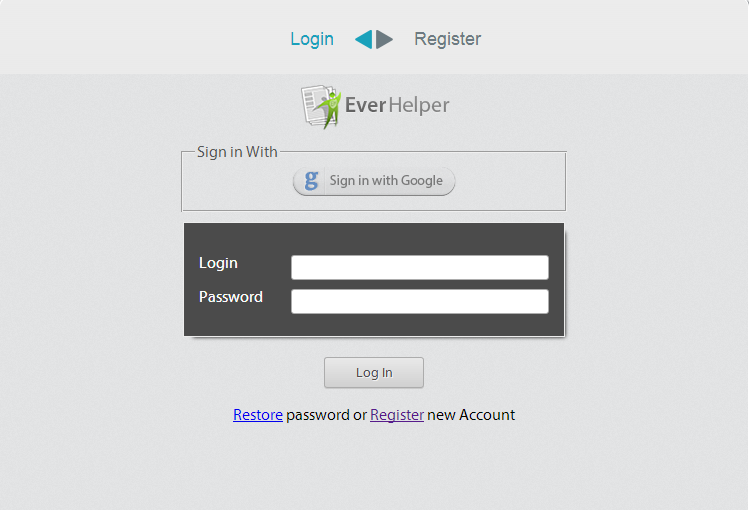 If you have used any of EverHelper’s services (EverSync, FVD Speed Dial, etc.) before, then you probably already have an account you can use. If you already have notes in Nimbus, they are synchronized automatically when you enter the account. If you already have created notes in Nimbus on other devices, the first synchronization may take some time and you will need to wait. 3) If you need to create a new note, please press the button. 4) Use Nimbus Note to create new notes as well as to save practically any information from web pages. Simply highlight the section of the text that you want saved and click the Nimbus Note button. 5) You can synchronize your notes any time by pressing the sync button. 6) If you need to create a new folder, please press the button. You can delete a folder or note by pressing the button. 7) If you do not want the add-on button for Internet pages, you can disable it in Settings. Unfortunately, sometimes your notes may not load right away. This sometimes happens bacause the database used in Chromium is not too efficient and may freeze. If this happen, you either need to wait until the notes load or close the application and reopen it again after waiting a moment. 9) If you need a direct link to your note, click . However, you will need to run a synchronization first for your note to get to the server. 10) If you would like to work in full screen mode, you need to click ; the note panel will then become more compact. How do I sort my notes? Press and select the sorting option. Currently, you can sort by date and name. How do I restore notes from backup ? Note backup is performed on a daily basis; backup from the last three days is stored. To view back-ups, you need to go Settings => Backups. You will see a list of back-ups there. To restore from a back-up, you will need to press the Restore button. Please keep in mind that if you delete your notes from the server, only the text information will be restored; it will be impossible to restore the images.